Dexpot turns your monitor into up to 20 monitor workspaces. Dexpot creates additional workspaces you can quickly switch between. Take, for example, Desktop 1 to listen to your favourite music, surf the web on Desktop 2, use Desktop 3 to handle your daily word processing or switch to Desktop 4 for a game of Solitaire. 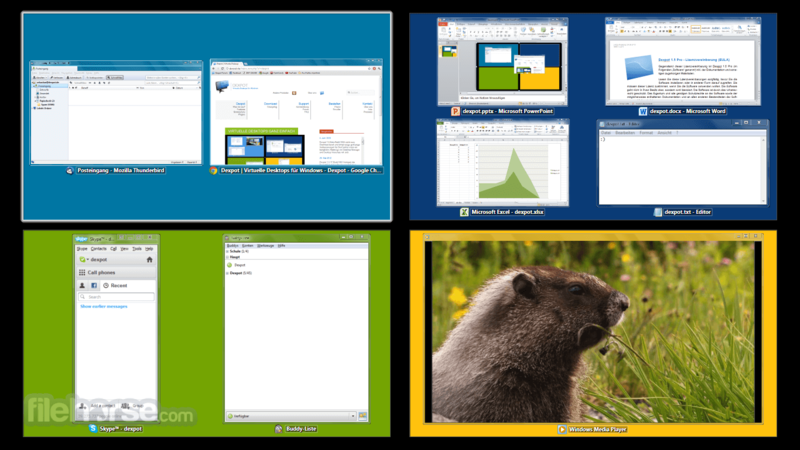 Different icons, wallpapers, start-ups, and much more can be configured for each desktop. What's the use of virtual desktops? Overcome desktop clutter, facilitate working with many applications and organize applications into work areas. Is an interactive live overview of all desktops. You can move windows to other desktops by simply dragging them with your mouse. Other, more advanced features like copying and closing of windows or tiling and zooming of desktops are available via easy-to-use mouse and keyboard controls as well. A miniature symbolic version of the Full-screen preview, but just as powerful. Move and copy applications across desktops with drag-and-drop. Desktop Preview automatically hides at the screen edge when you don't use it. Desktop Manager is a small, always visible toolbar for quick desktop switching. It can be positioned anywhere on your desktop and adjusted in size and orientation. Optionally, it shows the icons of all desktops' active applications. There's a hotkey for pretty much every task in Dexpot, enabling you to handle Dexpot really fast after just a brief period of familiarization. 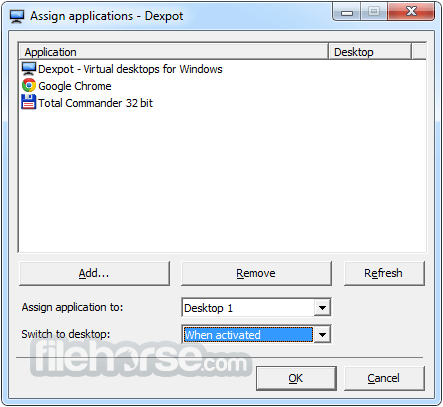 Switch desktops by just moving your mouse cursor to a specific area of the desktop. 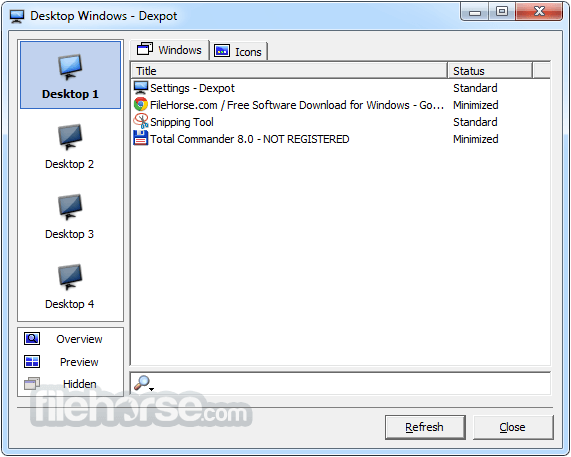 Dexpot appends easily accessible options to the system menus of all windows. A right-click on the title bar is enough to e.g. move the window to another desktop. Taskbar Pager integrates an overview of all desktop directly into the taskbar of Windows. The pager not only lets you switch desktops, but also move or copy (keep CTRL pressed) windows via drag-and-drop. All components of Dexpot are compatible with multiple monitors. The exact behavior of many components can be further adjusted to suit your needs. In case you want windows on individual monitors to remain visible on all desktops and content to be static, you can exclude monitors from desktop switching. Beautify your desktop with a real-time working clock blended into beautiful artwork becoming your desktop background.